We check over 450 stores daily and we last saw this product for $47 at Jet.com. Freshen up any bracelet styling with pastel purple. 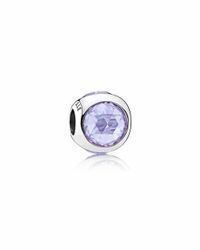 Simply add this hand:finished sterling silver charm with three rose:cut stones in a lavender colour. Women. Radiant Droplet Charm, Lavender CZ. 792095LCZ. Pandora Packaging.